I am slowly working my way to the end of Disney pages! While this probably doesn't look like a Disney page it is! It rained, again and my family took shelter at an area with tables. 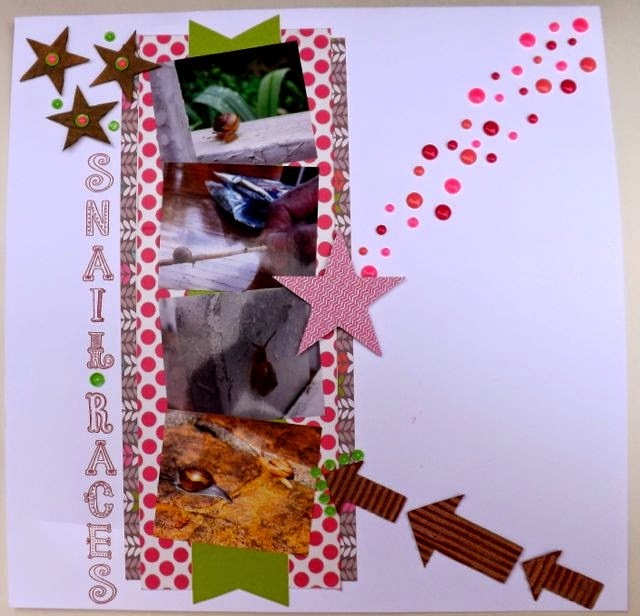 They discovered two snails and decided to have snail races! The pictures were too neat to exclude so I scrapped them, it was kind of the mundane in the middle of the incredible! This was such a fun layout to do! I joined several challenges and will detail them at the end of the post! I used the Lollydoodle paper as a striped paper, the pink polkadot is actually washi tape. The retired Milepost Embellishments were used for the arrows and stars except the pink one which I cut from the Lollydoodle paper on the Cricut with our Art Philosophy cartridge. 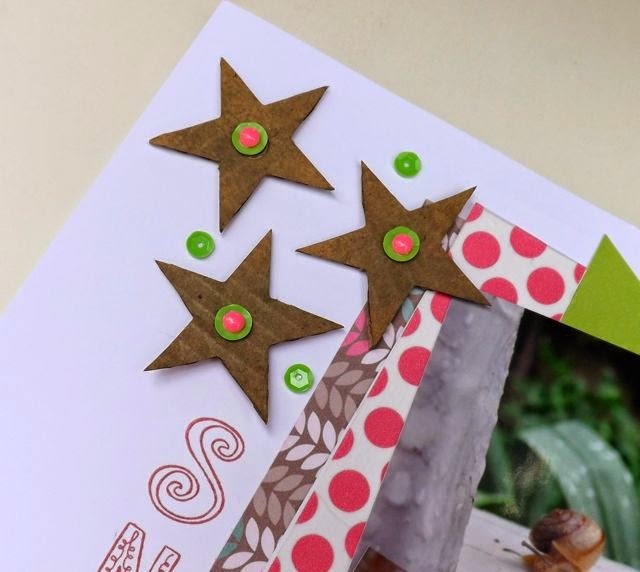 Leftover sequins from the Lollydoodle Card Workshop on the Go added a little pop of Pear! the pink dots are our totally fun Flamingo Dots, in three colors of pink and three different sizes! I also used the Stamp of the Month for July for the title! You can purchase it for $5 with a qualifying purchase, it's retail price is $17.95! It is such an adorable set! Below I inked the stars with some Slate ink and embellished them with the Pear Sequins and with the Flamingo dots in the center plus a few extra pops of green with the scattered sequins! Above I used a very useful technique with Washi tape! I cut strips of White Daisy cardstock the same width as the pink polkadot Washi tape and applied the washi to it! If I had not done this the washi tape would have been lost in the gray background paper! Below, I love my snail trail to the star with the Flamingo dots! So I joined four different challenges for this layout! The first one was Southern Girls Challenge to include circles! I didn't do it in the obvious way but there are circles with the sequins, Flamingo Dots and on the washi tape! 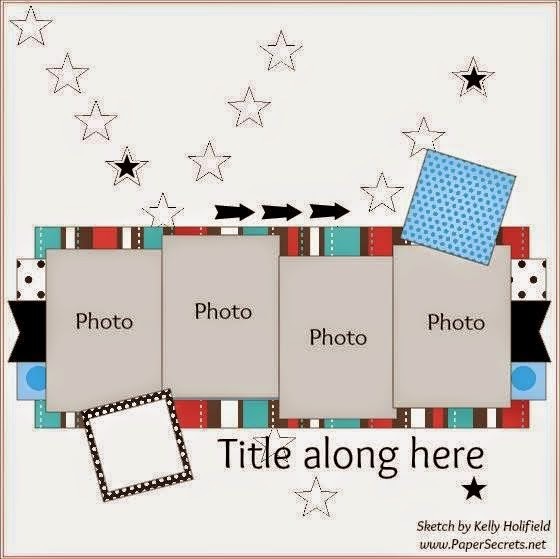 The second was Scrap our Stash Challenge #16! We had a shopping list to shop our stash for and had to use 5 different things! I used: Stars, enamel dots, sequins, washi tape, striped paper and arrows! plus an item to go with each letter of Splash! I also entered it in the Take Heart Ideas blog challenge where anything goes! Hope you enjoyed my challenge craze! Thanks Tina, I had fun making it! I love how you rotated the sketch!! Thanks for joining us at Scrap & Play!! great use of items for the shopping list!!! Thanks so much for playing along with us at Scrap Our Stash!! It was fun to challenge myself to use my stash by shopping it! Fun page! 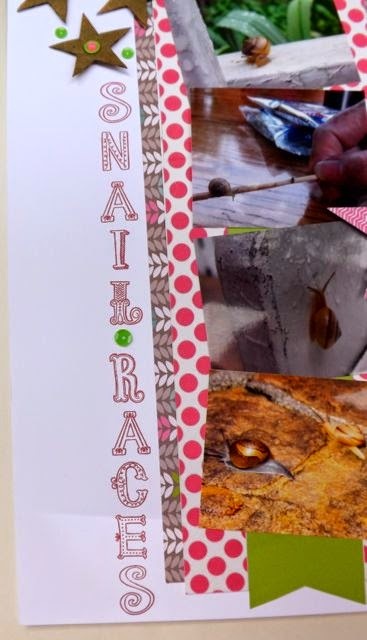 Thanks for entering it on this month's challenge at TakeHeartIdeas.com (which must be the 4th challenge). I love the stamped title font! Love how you flipped the sketch! Thanks for joining us at Scrap & Play! This is a really fun page! Love your shopping list! Thanks for playing with SOS! love how you flipped the sketch and the fun enamels!!!! thanks sooo much for playing along with Scrap & Play!!!! Isn't always the nontraditional photos that tell the best stories. This is great. I love the way you created movement with the arrows and then the dots. Thanks for joining Take Heart Ideas Challenge this month. Nicely done and I like that you rotated the sketch! Thank you for linking up with Paper Secrets! Love your take on the layout! Thanks for joining us at S&P! Super LO Linda. Thanks for joining us at Southern Girls Challenge. Love all those stars and arrows! Thanks for playing along at Scrap Our Stash! great take on the challenge! Thank for playing along at SOS! Love the enamel dots grouping!